Why A Confident Mindset Matters — And 5 Tips On How You Can Develop One. Researchers at the University of Melbourne found that those who rated themselves as more confident earned higher wages and were promoted sooner. Another study found that by momentarily boosting men’s confidence using cologne, the men appeared more attractive to women even in photos. Clearly, how we feel about ourselves impacts how we carry ourselves in the world and how we’re viewed by others, whether in our personal or business lives. As somebody who struggled with low confidence for many years, I know from experience that a confident mindset can be life-changing. But what exactly is it about a confident mindset that’s so powerful? And for the many people out there who find confidence an uphill struggle, is it something that can be developed? Confident people believe in themselves. This is what’s known as a self-fulfilling prophecy. It’s when a prediction or expectation — positive or negative — influences a person’s behavior in a way that causes the prediction to come true. If you believe you’re destined to fail, you behave in ways that hinder your success. You might talk yourself out of applying for your dream job because you don’t feel capable, for example. Confident people, on the other hand, believe that their success is inevitable. Consequently, they take advantage of all opportunities that will take them closer to their goal. Confident people face their fears and take risks. Most worthwhile goals involve an element of risk, but with risk comes fear. Fear of failure, rejection, making a fool of ourselves — they’re all natural to an extent, but we can end up so paralyzed by thoughts of what could go wrong that we never take action towards our goals. Those with a confident mindset experience fear too, but they’re able to minimize its influence. They aim higher, step outside their comfort zones and open themselves up to many more opportunities for success. They turn ideas into action, and they’re not afraid to make unpopular or unconventional decisions in the process. Because they believe in their ability to succeed, and they’re confident in their ability to overcome any challenges they might encounter on the way. Perhaps more importantly, they trust that they’ll be able to recover and move forward if their risk doesn’t pay off. Failure is a fact of life, even for the most confident of people. However, they tend to be much more resilient, finding it much easier to bounce back after failure or rejection. As a result, they’re much more likely to keep trying again and again until they succeed. If you struggle with low confidence, you’re likely to have a rigid view of failure, attributing it to a personal characteristic, fault or weakness that can’t be changed. Didn’t get the job? Obviously the interviewer realized you’re just not intelligent enough — time to give up and find a new career! When they experience failure, they’re much more likely to look for causes within their control. Didn’t get the job? Obviously you need to improve your computer skills to compete with other candidates — time to enroll in a course! Confident people have better relationships. In any area of your life, the ability to build positive relationships is critical to your success. This is a skill that seems to come more easily to those with a confident mindset, and there are several reasons for this. The confident person goes into interactions expecting a positive response, and this influences how he communicates. Other people subconsciously pick up on his confidence, which shapes how they view him. A boss may perceive him as competent and in control, for example. Confident people also tend to have higher self-worth, and they believe that their needs deserve to be met within any relationship, business or personal. For that reason, they’re usually much more comfortable being assertive, asking for what they want, and setting appropriate boundaries. Can You Create A Confident Mindset? Many people believe that confidence is an innate quality — you either have it or you don’t. By that logic, it should be impossible to knock somebody’s confidence, but we all know that’s not true! Just like it can be knocked down, confidence can be built up. Those confident people you admire weren’t born oozing self-assurance. 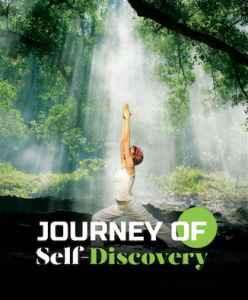 It was developed by a combination of life experiences and even conscious choice. That’s right, you can actively decide to be more confident! 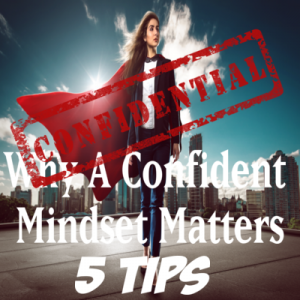 Here are my top five tips for creating a confident mindset. First things first — ditch the fixed mindset! Holding on to the belief that your attributes are set in stone robs you of all control over your destiny. It gives you an excuse not to take risks, and it gives you an easy way out when the going gets tough. Instead, embrace the idea of growth. Understand that attributes like intelligence, creativity, and logic can all be improved, and that any skill you desire can be learned or enhanced. This growth mindset means that, in the event you do experience failure, you’ll be more inclined to view it as an opportunity for development, rather than a personal indictment. Focusing solely on the risks does nothing but feed your fears. While it’s always a good idea to anticipate challenges, try to shift your perspective towards how you might overcome them instead. Write a list of potential challenges you might experience, and then brainstorm solutions. You can then approach the situation knowing that you have a solution for almost any outcome. Not only that, but if a challenge does arise, your confidence will be bolstered by the fact that you were prepared and able to handle it. 3. 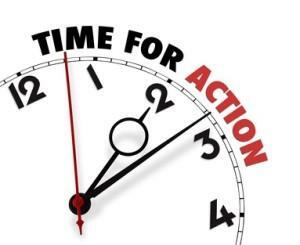 Take action — any action! Confidence gives you the power to be an active creator in your own life, but fear would rather keep you stuck in a safe, passive role. Sometimes the best thing to do is simply stop listening to the negative voice of fear and take action. Set your success in motion by doing one thing, however small, that will take you closer to your goal. The fear is usually always worse than the reality, and seeing this for yourself will boost your confidence and motivate you to take increasingly bigger steps. 4. Model, but don’t compete. A little competition keeps you sharp, right?! If you’re Serena Williams, then yes! But for us mere mortals, competing with our peers is a surefire way to send our confidence plummeting. We never see what’s really going on behind the scenes of other people’s lives, so we’re doing ourselves a huge injustice by competing with the ultra-polished, perfect Facebook version we do see. However, that’s not to say that you shouldn’t take note of genuine success stories. If somebody is excelling in an area related to your goal, then you stand to learn a lot by observing them and modeling the skills, habits, and behaviors that got them to the top. There’s an interesting quirk in the human mind called the ‘illusion of truth’. Essentially, if we hear something enough, we start to accept it as true, even when we’re presented with evidence to the contrary. You can use this quirk to fake your way to a confident mindset. By simply talking, thinking, visualizing and behaving like a confident person. As you do this, you’ll find that others respond to you positively. You’ll step out of your comfort zone and realize your fears were mostly unfounded. You’ll find you can manage challenges more competently than you thought you could. Your confidence will naturally grow until eventually, you won’t be faking it at all! Want to Supercharge Your Confidence? My membership site, Limitless, features over 100 recording sessions designed to help you develop unstoppable confidence. 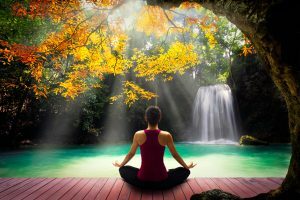 I use a combination of visualization, meditation, and hypnosis to help you banish fear, unleash your inner power, and develop the mindset of a true winner. If you’re ready to discover how a confident mindset can change your life, click on the button below and start your Membership Today!